SAN FRANCISCO -- The Giants put catcher Buster Posey on the seven-day concussion disabled list Tuesday, and Tim Federowicz got called up to back up Nick Hundley. Posey was said to be feeling all right, but the team committed to making the move out of an abundance of caution. There was no need to take any risks given Posey's position. Posey was hit on the back of the helmet by a 94 mph Taijuan Walker fastball in the first inning of Monday's home opener. He sat down, waiting for trainer Dave Groeschner with a dazed look on his face. Groeschner immediately pulled Posey from the game and took him to the clubhouse for tests, which Posey passed. 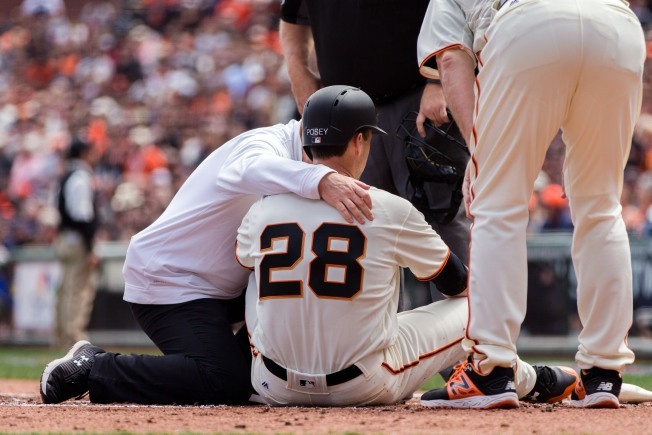 Posey told teammates that he felt normal, and that he was not experiencing the symptoms he expected. On his way out of the ballpark, Posey told NBC Bay Area that he felt fine. But the training staff monitored Posey overnight to make sure he did not have a delayed reaction. The Giants have embraced a much more proactive approach to concussions after several players suffered from late-showing symptoms in recent years. Brandon Belt missed 12 games with a concussion in 2014, returned too early, and then missed another 34 games after seeing a specialist. Joe Panik played for over a week after getting hit in the head last season and then ended up missing 23 games. Major League Baseball now has the seven-day concussion DL for situations like this one. The Giants will have to clear a 40-man roster spot for Federowicz, a veteran who had a big camp before accepting an assignment to Triple-A Sacramento.